Maxine Yvette Martin dies. Maxine Yvette Martin lurks in the void. Then, Maxine Yvette Martin catches a break and slips into the body of suicidal young man. Her stolen body miraculously survives a fall from the Golden Gate Bridge, and Maxine Yvette Martin starts a second life as Max Hoffman. This body might be new, but her mind is still the same, and she struggles to find a way to live a familiar life in deeply unfamiliar circumstances. CROSSING THE BRIDGE is a completed short story 5,600 words in length. It explores the nature of gender, the nature of compromise, and the way we shape the world to ourselves in order to survive. I am so glad this story found a home with Glitterwolf. This story was a stretch for me—a contemporary piece, a fantasy not set in Aerdh, a ghost story, a short story written while I was still learning how to write short stories. And this story is personal; this story is about being trans*. 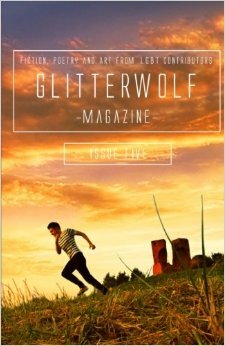 Glitterwolf is a publication that celebrates LGBT poets and writers, and given that I poured a lot of my own transness into this story, given how linked the content of the story and my lived experiences as its creator are, I am really happy it found a home in a publication where my own queerness and transness can be explicitly stated. Many thanks to Matt Cresswell, editor of Glitterwolf, for including my story in the issue! This entry was posted in announcements, B's Short Fiction, CROSSING THE BRIDGE, Glitterwolf, Publishing and tagged crossing the bridge, gay fiction, glitterwolf, glitterwolf magazine, lgbt fiction, publication, publishing, queer fiction, short fiction, short story, trans*, transgender fiction by brsanders. Bookmark the permalink.